Fishing Rod is used for Fishing in water. The player will need to have the fishing rod in their hand and right click to throw the bobber into water. The bobber will start to move in the water when a Raw Fish is attached to it and can be caught by right clicking again. 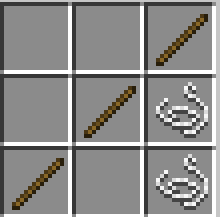 If the player is quick enough with the fishing rod then the fish will be reeled into their inventory. The player is able to use the fishing rod to catch Raw Fish, Raw Salmon, Clownfish, Pufferfish, or various other items.